Background and objectives Management strategies are unclear for late-onset cytomegalovirus infection occurring beyond 6 months of antiviral prophylaxis in cytomegalovirus high-risk (cytomegalovirus IgG positive to cytomegalovirus IgG negative) kidney transplant recipients. Hybrid strategies (prophylaxis followed by screening) have been investigated but with inconclusive results. There are clinical and potential cost benefits of preventing cytomegalovirus-related hospitalizations and associated increased risks of patient and graft failure. We used decision analysis to evaluate the utility of postprophylaxis screening for late-onset cytomegalovirus infection. Design, setting, participants, & measurements We used the Markov decision analysis model incorporating costs and utilities for various cytomegalovirus clinical states (asymptomatic cytomegalovirus, mild cytomegalovirus infection, and cytomegalovirus infection necessitating hospitalization) to estimate cost-effectiveness of postprophylaxis cytomegalovirus screening strategies. Five strategies were compared: no screening and screening at 1-, 2-, 3-, or 4-week intervals. Progression to severe cytomegalovirus infection was modeled on cytomegalovirus replication kinetics. Incremental cost-effectiveness ratios were calculated as a ratio of cost difference between two strategies to difference in quality-adjusted life-years starting with the low-cost strategy. One-way and probabilistic sensitivity analyses were performed to test model’s robustness. Results There was an incremental gain in quality-adjusted life-years with increasing screening frequency. Incremental cost-effectiveness ratios were $783 per quality-adjusted life-year (every 4 weeks over no screening), $1861 per quality-adjusted life-year (every 3 weeks over every 4 weeks), $10,947 per quality-adjusted life-year (every 2 weeks over every 3 weeks), and $197,086 per quality-adjusted life-year (weekly over every 2 weeks). Findings were sensitive to screening cost, cost of hospitalization, postprophylaxis cytomegalovirus incidence, and graft loss after cytomegalovirus infection. No screening was favored when willingness to pay threshold was <$14,000 per quality-adjusted life-year, whereas screening weekly was favored when willingness to pay threshold was >$185,000 per quality-adjusted life-year. Screening every 2 weeks was the dominant strategy between willingness to pay range of $14,000–$185,000 per quality-adjusted life-year. 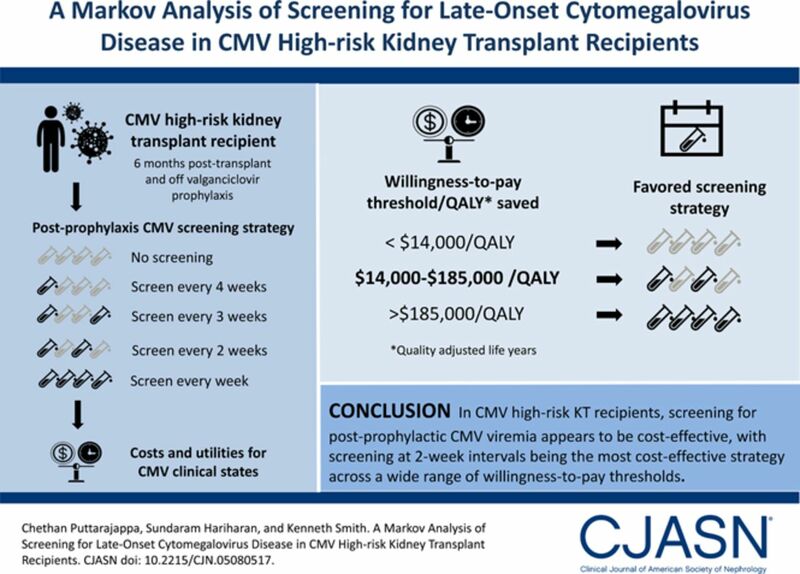 Conclusions In cytomegalovirus high-risk kidney transplant recipients, compared with no screening, screening for postprophylactic cytomegalovirus viremia is associated with gains in quality-adjusted life-years and seems to be cost effective. A strategy of screening every 2 weeks was the most cost-effective strategy across a wide range of willingness to pay thresholds. Incidence of primary cytomegalovirus (CMV) infections in patients with high-risk (HR; donor IgG seropositive to recipient IgG seronegative) kidney transplants (KTs) is significantly reduced with valganciclovir prophylaxis (1). However, late-onset CMV infection occurring after completion of antiviral prophylaxis remains a problem, with a reported incidence of 10%–38% (2–7). This has been associated with increased risk of hospitalizations, graft failure, and patient mortality (6,8,9). Hybrid strategies (i.e., prophylaxis for 3–6 months followed by screening for viremia) have been investigated as a method to detect infection early and reduce adverse consequences of late-onset CMV disease. However, they have not shown convincing results of efficacy (3,7,10). There was significant variability among these studies in the frequency and duration of screening. The studies also used different viremia thresholds to initiate antiviral therapies. The 2013 consensus conference on CMV in solid organ transplantation (11) did not recommend the hybrid strategy owing to lack of evidence for efficacy. However, it did note that many transplant centers reported using a hybrid approach, at least in patients with HR CMV. Primary CMV infections in patients without anti-CMV immunity usually follow a predictable pattern of early asymptomatic viremia followed by symptoms at higher viremic states (12–14). The timeline of infections after cessation of prophylaxis is also well characterized (2,7,15). Additionally, studies have reported CMV replication kinetics that can be used to decide on screening intervals (16–18). We have previously reported that screening every 4 weeks for CMV viremia after 6 months of valganciclovir prophylaxis showed a trend toward detecting early viremias and a trend toward lower CMV-related hospitalizations (7). Given the aforementioned CMV characteristics and the availability of effective antiviral drugs, we performed a decision analysis of postprophylactic screening strategies for CMV in HR KT recipients. We used a Markov decision analysis model to compare screening with the cytomegalovirus nucleic acid amplification test (CMV-NAAT) at different intervals for late-onset CMV infection. We estimated the cost-effectiveness of screening for CMV infection after completion of 6 months of valganciclovir prophylaxis. The model compared CMV-NAAT screening at intervals of every 1, 2, 3, or 4 weeks over a no screening strategy. Screening began after stopping prophylaxis and continued until 1 year post-transplantation. CMV infection severity was considered proportional to the level of viremia. All positive CMV viremias required initiation of antiviral therapy with valganciclovir. The CMV-NAAT was considered 100% sensitive and specific. Adherence with screening was assumed to be 100%. CMV resistance was assumed to be 0%. Figure 1 shows the Markov transition diagram. All patients entered the model after completing 6 months of antiviral prophylaxis post-transplantation, which is defined as the “well state.” With screening, the patient could remain in the well state, lose the transplant, die, or enter one of the CMV states (asymptomatic CMV viremia, mild CMV infection managed as outpatient, or CMV infection requiring hospitalization). Hospitalized patients with CMV (defined as severe CMV infection) transitioned to an outpatient severe CMV state after hospital discharge. CMV incidence after graft failure was assumed to be zero for the model purposes. Markov state transition diagram describing various clinical states in the model and the possible transitions between them. Well indicates a patient with cytomegalovirus (CMV) high-risk IgG serostatus (D+/R−) after completion of 6 months of valganciclovir. Each subject enters the model in the well state and moves onto different CMV or non-CMV states as shown in the diagram on the basis of the input probabilities. Treatment is initiated at the first detection of CMV infection (either asymptomatic viremia or symptomatic infection). The model runs until all subjects are dead. Model does not account for recurrent CMV infections. 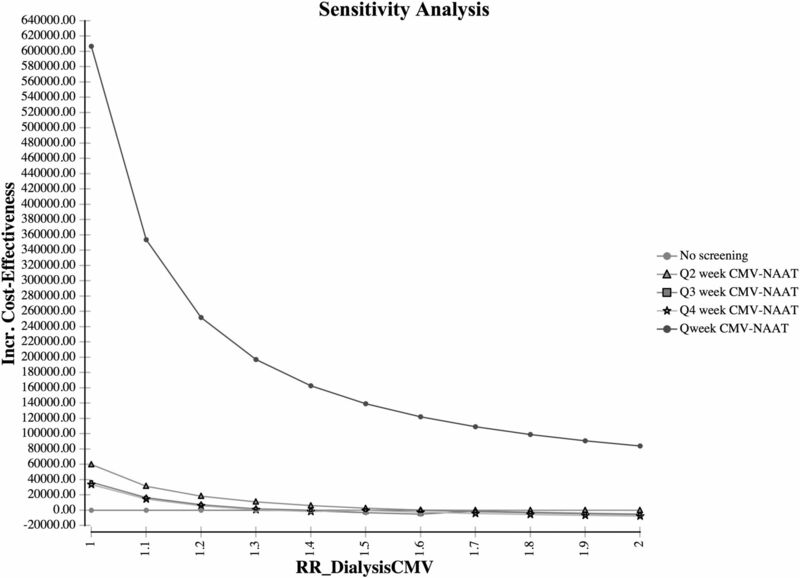 Risk of CMV is considered zero after starting dialysis for the model purpose. Probabilities used in the model are provided in Table 1. We used published data for the incidence of late-onset CMV in kidney transplantation and its association with hospitalizations, graft, and patient loss. Probability of becoming symptomatic was considered time dependent, and it was extrapolated on the basis of CMV replication kinetics; the likelihood of becoming symptomatic increased with each successive cycle as shown in Table 1. Additional probabilities for the model are provided in Supplemental Table 1. For analysis purpose, we defined severe CMV as CMV infection that necessitated hospitalization. Cost and mortality data for CMV-related hospitalization were derived from the 2014 National Inpatient Sample, the Healthcare Cost and Utilization Project (HCUP), and the Agency for Healthcare Research and Quality using a primary discharge diagnosis of CMV (International Classification of Diseases, Ninth Revision, Clinical Modification 078.5) (19). The HCUP currently does not allow combined diagnoses, and hence, we were unable to use KT-specific CMV hospitalization data. To reduce the limitation, we used median costs for the base case analysis, and in sensitivity analysis, we used a range that incorporated the cost distribution for CMV hospitalization. Rates for graft failure and mortality after kidney transplantation and mortality on dialysis were obtained from the 2015 US Renal Data System (USRDS) report (Supplemental Table 2) (20). Cost and utility data are shown in Table 2. The utility value for a health state ranges from zero for a dead state to one for a state of perfect health. We used published data for utilities of transplant and dialysis states. Assumptions were made for CMV states. Asymptomatic CMV was assumed to have the same utility as a healthy patient with a KT; utility then decreased as CMV disease severity increased. Annual costs for a KT recipient and a patient with ESRD were obtained from the 2015 USRDS report (20). Cost of outpatient CMV treatment per week included valganciclovir cost ($800 per week), weekly CMV-NAAT ($65), and travel cost to the laboratory ($50). Additionally, two office visits (Current Procedural Terminology code 99214) and travel costs are included for outpatient follow-up of severe CMV occurring after hospital discharge. We did not include posthospitalization rehabilitation and home health care costs or indirect costs due to productivity loss. A decision analysis model was constructed with the Markov state transitions and probabilities. Cycle length was 1 week given that CMV replication and clinical manifestations occur over a short interval. A lifetime analysis was performed, allowing the model to run until the patient died. Analysis was from a societal perspective. Incremental costs were calculated as difference in costs between two adjacent strategies, with strategies ranked by ascending cost. Incremental cost-effectiveness ratios (ICERs) between two strategies were calculated as a ratio of the incremental cost to the difference in quality-adjusted life-years (QALYs) gained or lost, and they are reported as dollars per QALY gained. For the base case analysis, ICERs were calculated using the data as shown in Tables 1 and 2. We then performed one-way sensitivity analysis to assess for responsiveness to variation in data parameters. Results of the sensitivity analysis were used to obtain parameters for variables at which the ICERs exceeded a certain cost (in dollars) per QALY gained. We used $20,000 or $50,000 per QALY on the basis of our base case analysis results. We also relaxed the assumption of 100% adherence and performed a one-way sensitivity analysis with adherence rates of 0%–100%. To test the robustness of model results when all parameters were varied simultaneously, we performed a Monte Carlo probabilistic analysis by drawing randomly 1000 times from distributions with ranges as noted in Tables 1 and 2. We used β-distribution (range, 0–1) for utilities and probabilities, γ-distributions (value ≥0) for cost variables, and triangular distributions for variables that had minimum, maximum, and mode values. These results were used to generate acceptability curves for the different screening strategies. Acceptability curves were used to identify the favored strategy at various willingness to pay (WTP) thresholds. WTP is a hypothetical amount that an individual or society is willing to pay to save one QALY. We also performed base case cost-effectiveness analyses for a model that assumed no increased hazard for death or graft failure related to CMV infection and a model that assumed a 20% spontaneous CMV resolution. All analyses were conducted with the 2016 TreeAge-Pro software. Both costs and QALYs gained increased with increasing frequency of testing with corresponding ICERs as shown in Table 3. Going from no screening to screening every 4 weeks cost $783 per QALY gained, and increasing to every 3 weeks from every 4 weeks cost an additional $1861 per QALY. Similarly, ICERs for screening every 2 weeks over every 3 weeks cost $10,947 per QALY. ICERs increased sharply for weekly screening over every 2 weeks, with each QALY gained costing an additional $197,086. Results were sensitive to CMV screening test cost, CMV incidence after stopping prophylaxis, the probability of spontaneous resolution of CMV viremia, inpatient CMV costs, and the probability of graft failure after severe CMV infection. Results were not sensitive to variation of utilities and variation in outpatient CMV treatment cost. Table 4 shows the sensitive variables in one-way analyses along with the corresponding values that cross ICER thresholds of $20,000 or $50,000 per QALY for a strategy of screening every 2 weeks over screening every 3 weeks. Going from every 3-weeks to every 2-weeks screening will cost >$50,000 per QALY in the following situations: if CMV-NAAT cost increased above $200, if CMV incidence between 6 and 12 months dropped below 7%, if spontaneous CMV resolution was >23%, or if relative risk (RR) of dialysis from CMV was <3%. Similarly, going from an every 3-weeks to an every 2-weeks screening will cost >$20,000 per QALY if CMV-NAAT cost increased above $98, if CMV incidence between 6 and 12 months dropped below 14%, if spontaneous CMV resolution was >10%, if RR of dialysis from CMV was <19%, or if CMV hospitalization cost was <$6600. Cost-effectiveness results were highly sensitive to the risk of graft loss after CMV infection. Cost-effectiveness of all screening strategies increased with increasing risk of graft loss from CMV (Figure 2). When the RR of dialysis increased to 1.4, the no screening strategy became costlier and yielded lower QALYs than screening every 2, 3, or 4 weeks (Supplemental Table 3). Change in incremental cost-effectiveness ratios (ICERs) with varying risk of dialysis after cytomegalovirus (CMV) infection. ICERs decrease for all screening strategies compared with no screening as the risk of graft failure related to CMV increases. CMV-NAAT, cytomegalovirus nucleic acid amplification test; Q, every. Results of one-way sensitivity analyses with adherence rates are shown in Supplemental Table 4. All strategies remained cost effective even at low adherence rates. Figure 3A shows the acceptability curves for the different strategies with increasing WTP thresholds, whereas Figure 3B shows the percentage of iterations favoring each strategy at WTP thresholds of $20,000, $50,000, and $100,000 per QALY gained. A strategy of screening every 2 weeks was the dominant strategy for the WTP range from $14,000 to $185,000 per QALY gained. No screening was the preferred strategy for WTP values of <$14,000, whereas screening weekly was favored only when the WTP threshold exceeded $185,000 per QALY. Thus, a strategy of CMV-NAATs every 2 weeks was the most favored strategy over a wide range of WTP thresholds. 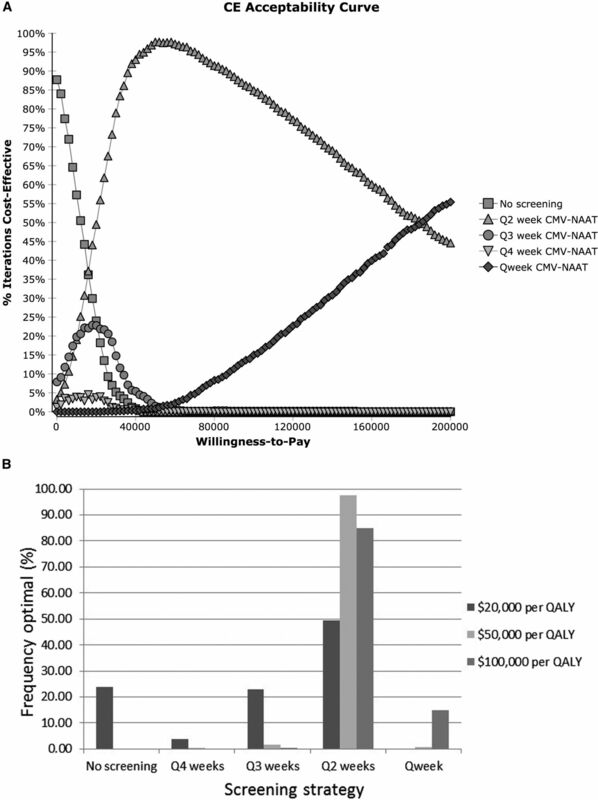 Probabilistic analysis results showing the favored cytomegalovirus (CMV) screening strategy across a range of costs per one quality-adjusted-life-year (QALY) saved. (A) Acceptability curves across increasing willingness to pay (WTP) thresholds for the five strategies (no screening and screening at 4-, 3-, 2-, and 1-week intervals). Proportion of favored strategy at each WTP threshold for one quality-adjusted life-year (QALY) gained is shown. No screening strategy is favored when WTP for one QALY is <$14,000. A 2-week screening strategy becomes favored when WTP increases to >$14,000 per QALY and remains the favored strategy until WTP exceeds $185,000 per QALY, at which point an every week screening strategy becomes the most favored strategy. (B) Percentage of iterations favoring the five different cytomegalovirus screening strategies at WTP thresholds of $20,000, $50,000, and $100,000 per QALY gained. Screening every 2 weeks was the dominant strategy at WTP thresholds of $20,000, $50,000, and $100,000 per QALY. CMV-NAAT, cytomegalovirus nucleic acid amplification test; Q, every. Cost-effectiveness results for a model that did not assume increased risk for death or dialysis in association with CMV infection are shown in Supplemental Table 5. Costs and QALYs gained both increased with increasing screening frequency. Screening for CMV every 2 weeks over screening every 3 weeks cost $58,368 per QALY in this model. Supplemental Table 6 shows the cost-effectiveness results for a model incorporating 20% spontaneous CMV resolution. Compared with every 2-weeks screening, screening weekly remained costlier but now, also yielded lower QALYs. Despite tremendous progress with managing HR CMV status KT recipients with 6 months of vaganciclovir prophylaxis, late-onset CMV infection remains a problem, with associated increase in morbidity and elevated risk of patient and graft failure (8,9). Studies on screening after prophylaxis cessation have been considered negative on the basis of the inability to prevent symptomatic CMV disease (3,10). Screening duration in these studies was 2–3 months, and threshold to initiate treatment was 10,000–25,000 copies per 1 ml, which might have been too high. Additionally, there is benefit in preventing severe CMV that necessitates hospitalization and is associated with worse outcomes (9). Hence, a decision analysis model incorporating the costs, utilities, and probabilities for various CMV clinical states without specifically looking at preventing only symptomatic CMV infection might aid in selection of a preventive strategy. Our results indicate that screening for late-onset CMV infection is cost effective and that, among the different screening intervals, screening every 2 weeks was the most favored. Increasing the frequency to weekly resulted in minor gains in QALYs with significantly higher costs, increasing the ICER close to $200,000 per QALY. The probability of developing severe CMV within the first week of onset of viral replication is low, particularly in late-onset CMV infection, which is associated with better CMV-specific T cell response than in states of early-onset disease occurring during a state of much more profound immunosuppression (21). Although $50,000 per QALY has been traditionally used as a threshold to consider an intervention as being cost effective, there is concern that this is too low, and recent recommendations have suggested a threshold of $100,000–$150,000 per QALY (22). We used lower thresholds ($50,000 and $20,000 per QALY) for our one-way sensitivity analysis, because the base case analysis yielded an ICER of $10,947 per QALY for the every 2-weeks screening strategy over the every 3-weeks screening strategy. Sensitivity analysis showed that the every 2-weeks screening strategy will remain cost effective, even with a three times higher cost for CMV screening test and even with low rates of late-onset CMV; ICER did not exceed $50,000 per QALY until the probability of late-onset CMV dropped below 7%. Management of low-level viremias (i.e., <1000 copies per 1 ml) in asymptomatic patients is unclear. Although there is a possibility of spontaneous resolution, the rates in patients with HR CMV are very low (3,10,23). Our results show that screening remains cost effective even as spontaneous resolution increases, except for weekly screening, which would more likely detect viremias that would otherwise spontaneously resolve. An alternative approach for these patients with low-level viremia would be to monitor more frequently (i.e., once or twice a week) while withholding antiviral therapy. Our findings were very sensitive to the small increases in the risk of graft failure in association with CMV infection. As the RR of graft failure increased, screening strategies were cheaper and yielded higher QALYs, unsurprising given the higher costs and lower quality of life with dialysis compared with transplantation. The effect of CMV infection on graft and patient survival has been analyzed in numerous studies, but the exact role and characteristics of CMV infection in these poor outcomes are not clear (6,8,9,14); there is some suggestion that late CMV infection may not be associated with any adverse graft and patient outcomes when treatment is initiated promptly (24). Our emphasis in the model was to find a strategy that will detect CMV infection at a reasonably early stage and at the same time, remain cost effective. Moreover, it is important to note that our findings show that the screening strategies remain cost effective even after eliminating risk of death or graft failure from CMV infection by reducing CMV-related hospitalizations and associated increased costs and patient morbidity. Our findings remained robust on probabilistic analysis and confirmed that the weekly screening strategy did not become cost effective until a WTP threshold exceeded a cost of $185,000 per QALY. It is important to also note that the no screening strategy was preferred only when the WTP threshold was <$14,000 per QALY, a significantly low WTP threshold compared with the recent recommendations for cost per QALY of around $100,000–$150,000. From an implementation standpoint, we feel that instituting a screening protocol for CMV every 2 weeks is feasible and may pose fewer logistic difficulties, because laboratory values are often being monitored frequently during this post-transplant phase. Given that the adherence rate with screening is unlikely to be 100%, results from the one-way sensitivity analysis over adherence rates are encouraging, because they suggest that the screening will remain cost effective, even with suboptimal adherence. This is different than adherence with a preemptive strategy to prevent early CMV, where the alternative is universal prophylaxis. Additionally, patients without access to a laboratory with quick turnaround times might face delay in antiviral initiation. This, however, would favor more frequent screening over no screening. As noted above, a no screening strategy would be favored only in situations of very low incidence of late-onset CMV infection or very high spontaneous resolution. Our analysis has several strengths. Given the paucity of data with regards to many aspects of late-onset CMV infection, we used a wide range of probabilities and utilities for sensitivity analysis. We also incorporated into the model a comprehensive range of late-onset CMV disease states to reflect real world CMV scenarios, thus encompassing a broader range of clinical and cost scenarios than the prevention of symptomatic disease alone. We used probabilistic analysis to assess the robustness of the findings. Our study does have limitations. Our model mandated treating all viremias and did not incorporate expectant management of low-level viremias. Currently, there is no defined standardized threshold to initiate antiviral therapy, but many clinicians favor initiating therapy, even for low-level viremias in patients with HR CMV. We feel that detecting low-level viremias by screening will provide an opportunity to actively monitor for progression and avoid complications from severe CMV disease. Our model did not account for situations where CMV severity is disproportionate to the viremia level; however, this situation is uncommon in CMV HR transplant recipients developing primary CMV infection (25,26). We also made assumptions for utilities of CMV states due to lack of published data on this topic; however, one-way sensitivity analysis showed no significant effect on ICERs with variation in utilities. CMV hospitalization data were not specific to kidney transplantation, which is another limitation. However, the results from one-way sensitivity analysis showed that screening every 2 weeks remained cost effective, even at low hospitalization costs. Finally, the utility of our decision analysis model should be seen in comparison with the potential alternatives for the management of late-onset CMV infection. Extending antiviral prophylaxis beyond 6 months has not been studied in KT recipients and comes with additional concerns of cost and drug toxicity. Similarly, the utility of assays measuring CMV-specific T cell immunity, such as the Quantiferon-CMV assay, may not be particularly useful in patients with CMV D+/R− given that only 25% of the patients have a positive result 2 months after stopping prophylaxis. However, the positive predictive value for protection from CMV disease was 90% in those with positive Quantiferon-CMV assay (27). A strategy that combines the Quantiferon-CMV assay and CMV-NAAT screening strategies on the basis of our model results needs investigation, because it is likely that screening might be of value only in those with a negative Quantiferon-CMV result. However, currently, the Quantiferon-CMV assay is not available for clinical use in the United States. In conclusion, results from our decision analysis model suggest that screening for late-onset CMV infection will be cost effective in CMV HR KT recipients and that screening at every 2-weeks intervals might be the most cost-effective strategy. Given the absence of controlled trials for late-onset CMV infection, we believe that our model provides information that can serve as a useful guide in a wide range of clinical and economic scenarios when selecting cost-effective CMV screening strategies for the postprophylaxis follow-up of CMV HR KT recipients. This study was presented as a poster at the 2017 American Transplant Congress Meeting held on April 29–May 3 in Chicago, Illinois. This article contains supplemental material online at http://cjasn.asnjournals.org/lookup/suppl/doi:10.2215/CJN.05080517/-/DCSupplemental.